Super Boswellia is a 100% naturalBoswellia Serrata supplement for improving comfort of the joints. Its enrichment with active principles (20% AKBA) and superior absorption make it one of the best supplements on the market, along with Joint Support Formula. Who is Super Boswellia aimed at? those affected by decreasing flexibility in certain joints. Boswellia serrata is a tree indigenous to India, the Middle East and Africa which belongs to the Burseraceare family. The resin it produces is one of the most popular natural health products available today, especially with those plagued by joint problems. An oleo-gum resin known as ‘olibanum’ or ‘incense’ is produced by resin-secretory structures in the tree, and tapped from incisions made on its trunk. This resin solidifies on contact with air and releases a pleasant scent when burned. It is teardrop-shaped, around 2cm in diameter, amber-brown in colour with a very brittle consistency. It is held in particular esteem by the world’s principal traditional systems of medicine. In Ayurvedic medicine, it is known as ‘Salaï Guggul’ or ‘Shallaki Guggul’ (1). Super Boswellia is formulated to contain up to 20% AKBA, a much higher than normal level. It is made from the Boswellia serrata tree, as this is the richest source of AKBA (2). Extract of Boswellia serrata generally consists of 5-10% essential oil (including primarily α-pinene, α-thuyene, myrcene and sabinene), and also importantly, four boswellic acids including AKBA and KBA, the tree’s major active principles. Where does Boswellia serrata come from? How is Super Boswellia made? The Boswellia serrata tree grows mainly in the dry regions of India, tropical Africa and the southern Arabian peninsula (Yemen, Oman). In summer or autumn, a few months after deep incisions have been made in the tree’s bark, the oleoresin gum is collected. Once it has solidified in the open air, it is scraped off as amber-coloured teardrops and the collected resin is then made into a dry extract and produced in vegetarian capsule form. Trees from the Boswellia species cannot go on producing good quality resin indefinitely: after three consecutive years of harvesting, they must be allowed to ‘rest’ for a few years. Super Boswellia is produced by the Laila Impex Research Centre, in India, an establishment recognised by the country’s Department of Scientific and Industrial Research (DSIR) and affiliated to a number of university programmes. What are Boswellia serrata’s mechanisms of action? Boswellia serrata was used by the Persians, Greeks, Romans, Indians, Chinese and other civilisations for ‘purifying the soul of the departed’ during ceremonial rituals, as well as for its medicinal properties. Ayurvedic texts credit its use with a wide range of benefits, especially improving joint health (3). These benefits are due to the two ingredients mentioned above, KBA and AKBA. A number of in vitro studies show that KBA and AKBA inhibit 5-lipoxygenase (5-LO), an enzyme which plays a role in inflammation and thus joint discomfort. AKBA is potentially the more effective of the two because of its acetyl group which gives it greater affinity with 5-LO. Other mechanisms of action are also under investigation (TNF, IL-1, MMP3…). How does Super Boswellia compare with other such supplements? 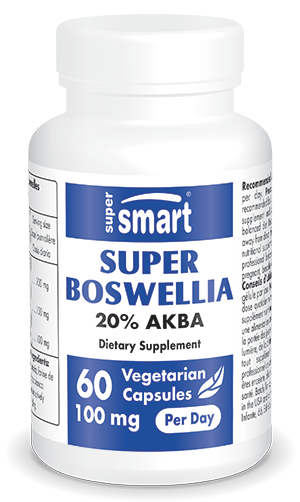 Super Boswellia has been specifically enriched with AKBA, the boswellic acid with the most pronounced effect on 5-LO. While many supplements are produced from other Boswellia species such as Boswellia carterii, Boswellia frereana and Boswellia bhau-dajiana, Super Boswellia is made from Boswellia serrata, the richest source of boswellic acid. What’s more, it has been shown to be better absorbed (by around 52%) than other extracts on the market. Why is the boswellia not grown in Europe? It is not possible to harvest from boswellia grown in Europe because the overly-humid conditions produce a coating on the resin which makes its extraction very difficult and causes the resin to be impermeable to solvents. Do the incisions made on the trunk cause serious damage to the tree? Boswellia is a robust tree which can easily withstand the cuts made to the bark when harvesting the resin. Having said that, it has to be allowed to rest for several years after three consecutive years of harvesting. What is the preferred dose? The suggested daily dose is one 100g capsule, to be taken with the most substantial meal of the day. With which other supplements can Super Boswellia be combined? While the bioavailability of boswellic acid is relatively low, it can be significantly increased by combining it with lipids. Eating food that’s high in fat (the healthy kind, of course) will thus increase the absorption of Super Boswellia, which is why it’s advisable to take it with a meal. Turmeric/curcuma supplements such as Natural Curcuma and Super Curcuma also help reduce inflammation and combining them with boswellia is likely to have a synergistic effect. There are two other supplements worth mentioning here: Smart joints creamUC II® 10 mg, a undenatured type II collagen supplement.